Road Blasters, a conversion by US Gold from back in 1989 that attempts to recreate the speed and thrills of the arcade original. Imagine a Bullrun Rally event played through 50 overcrowded highways where you must win each race in order to progress on to the next. Yes, I'm sure you already know that this is going to be fun!! What makes this game different is the combination of racer and shooter which means your gleaming red sports car has a mounted machine gun! The easiest targets are the yellow cars which are an easy kill but the motorbikes are a pest because of their tiny size. Occasionally several jeeps will swarm around you like something from a Mad Max movie which is hair-raising! Watch out for hazards like oil spills, roadside turrets, bullet-proof purple cars and those darn proximity mines. Fortunately, you do seem to have friends, a futuristic aircraft frequently flies by with power-ups: speed boost, extra weapons, shields, etc... It takes lots of practice to collect those goodies! At your disposal is a limitless supply of replacement cars but they are all greedy in fuel consumption, so if you run dry then its game over. Luckily, fuel pods are available and can be collected by simply drive through them for an instant top-up. Your car is also equipped with a reserve fuel tank which should only be relied upon as a last resort, but it is replenished at the end of each race depending on your performance. Controls are sharp and responsive steering that retains the arcade experience as much as possible using a joystick. Sound effects are pretty much average and I'm sure more could have been done but they certainly work well enough. 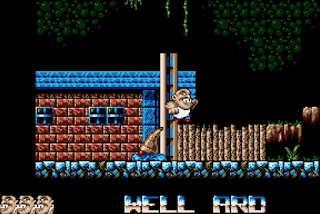 The graphics are an absolute joy with its arcade styles and a nice frame rate for such a mean-spirited event. I really loved this old arcade speedster, it might not be perfect but at least it's nothing like that dreadful Outrun! I've spent several nights playing Road Blasters and it's certainly got the "just one more go" quality. A much-underrated game that deserves far more attention. It's fast, fun and your car has a gun - what more could you ever want? 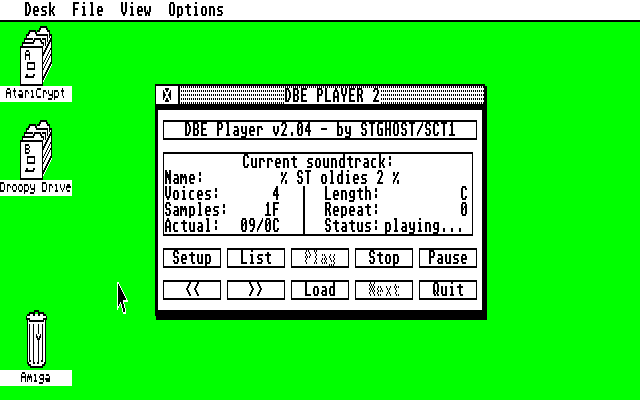 - 8BitChip have a hard drive installable version and Old Games Finder has the floppies. 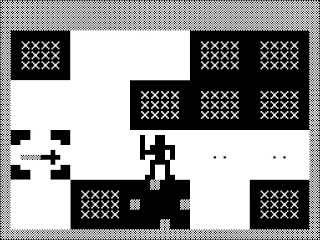 Back in the 90s, Christoph Zwerschke wrote a Sinclair ZX81 emulator for the Atari ST. From what I've so far seen, it's mute and the graphics are made up from monochrome blocks rather than colourful pixels. This might seem rather lame but there is a certain charm to the itsy-bitsy computer with less processing power than your kettle! 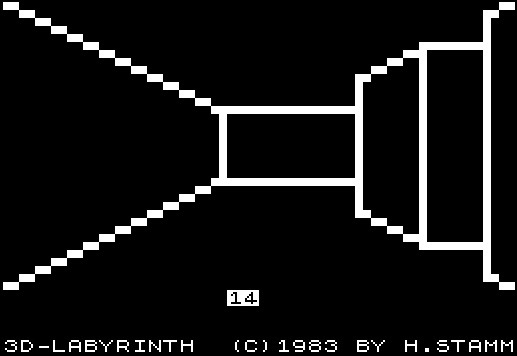 10 PRINT "ATARICRYPT ROCKS YOUR ST WORLD"
I've never previously owned a ZX81 so was shocked to find lots of games which are still surprisingly playable. 3D Monster Maze by Malcolm Evans is one such title and highly regarded as one of the best reason why so many adore this quirky old paperweight. Truly, this game is way ahead of its time and perhaps even the first survival horror game using a first-person perspective? (check out Retro Resolution for a fantastic review!). Okay, the stock Atari ST should be able to run most of the games perfectly fine and from either a floppy or (better still) hard drive. However, if you feel that the ZX81 is running in overdrive, then hit the UNDO key and adjust the speed limiter. I needed to do this for Pac-Man which was otherwise insanely fast! 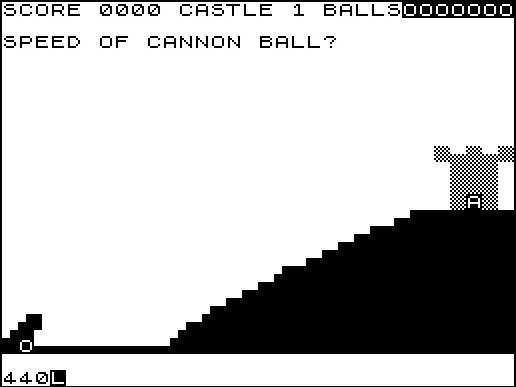 Sinclair ZX81 games I really, really, really like! Mazogs is something else but I was also impressed by the simplicity of Galaxians. Castle Of Carmain is just downright awesome as is the mighty 3D Labyrinth. 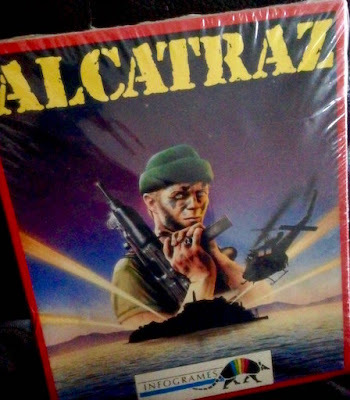 Today I have received a factory sealed treat off eBay, Alcatraz by Infogrames. I thought about leaving it as is - but within milliseconds I had ripped it open!! It's as close to mint condition as I could hope but I've spent very little time admiring the box instead of playing the game! The head honcho of a nasty drug cartel has taken shelter in Alcatraz prison and he also happens to be surrounded by many loyal henchmen. Yep, you've probably already guessed that it's your job to sneak in, kill the bad guys, destroy everything illegal and escape in the nick of time. This isn't a gung-ho game, Alcatraz is played using stealth and careful covert tactics. 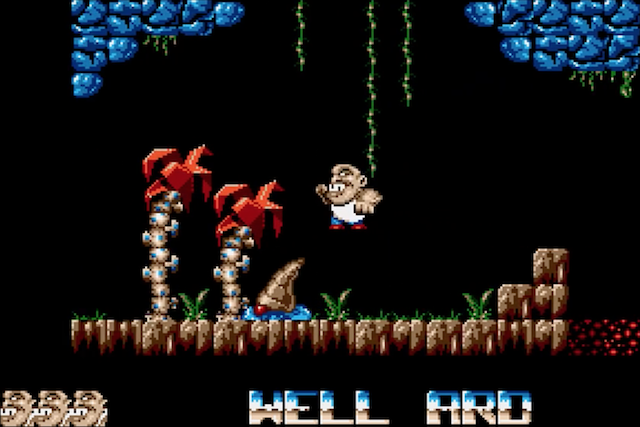 The starting level first appears in the style of an arcade beat 'em up but is actually the complete opposite. Tread lightly and firing your weapon isn't always the answer, use the darkness to your advantage by nipping into the background scenery, avoiding any unwelcome attention. However, this won't always be the answer and you'll need gunplay, but remember to silently throw a knife instead of using your BAM BAM noisy weapons! Once you are deeper inside Alcatraz, it will change into a first-person shooter very similar in presentation to a Dungeon Master clone - but with a machine gun. There is a handy map function which I really liked because it helps to detail the locations of enemies, rooms, and exit. Initially, the controls feel a little fluffy but stick with it and you will soon overcome its quirks. For those of you with friends, two players can enjoy Alcatraz simultaneously which should help overcome the low number of given lives, which I personally think is a little too restricting for such a demanding mission. Perseverance and stealth are definitely the name of the game and only now I am starting to make progress because I've stopped acting like Rambo and more like a secret agent. I'm loving Alcatraz and going back in for more - I hope you have enjoyed this preview? 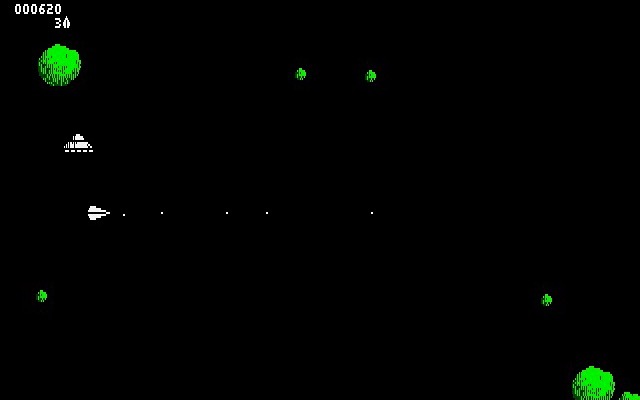 - Here is my humble video recording (taken from emulation). - Alcatraz can now be installed onto hard drive thanks to the mighty D-Bug. - For those wanting a floppy disk image, check out Old Games Finder! 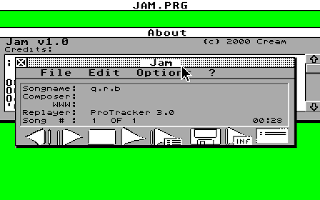 I recently stumbled upon a nifty resource that contains lots of Atari ST goodies just waiting to be downloaded. It's the leftover remains from what used to be a popular BBS in Germany called Traveller-Box, by Alexander Bochmann. 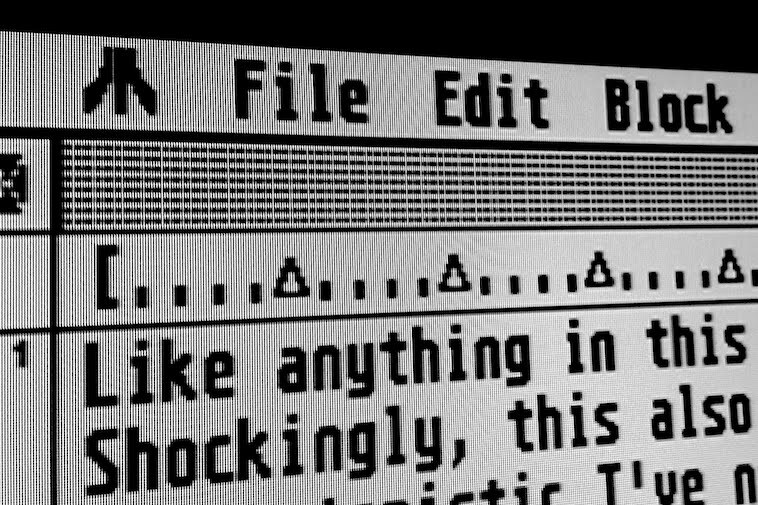 His old hard drives have been recovered and their BBS contents uploaded for the Atari community to enjoy again!! 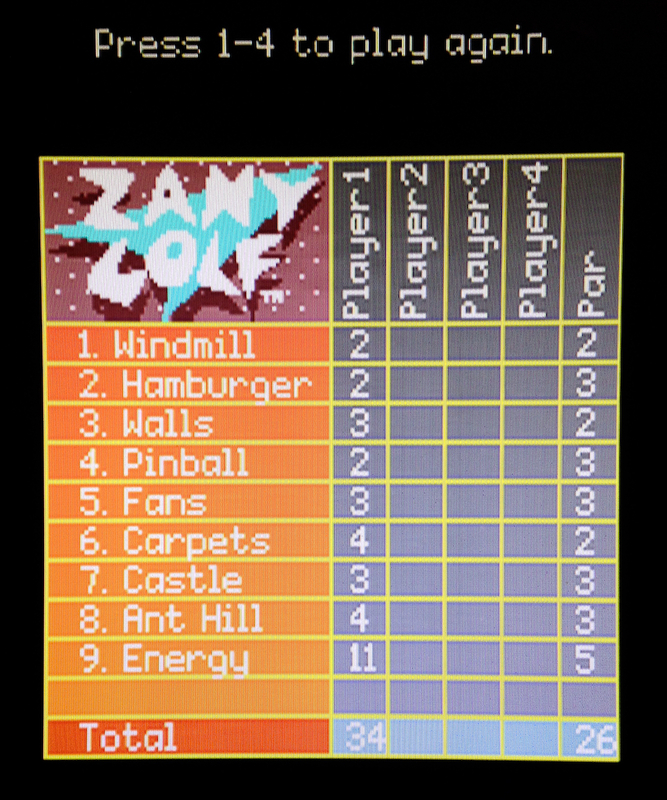 Zany Golf is one of those game which I spent much of my college years playing. It is such an incredibly addictive and entertaining crazy game - especially with friends. Forget the scruffy, badly maintained crazy golf courses in your local park because Zany Golf is a sprightly alternative from the creative mind of Will Harvey (The Immortal). It's quirky, it's very silly and it's also a little lame... Yes, Zany Golf is freaking excellent and highly recommended!! - A screenshot of my current progress... Hmmm!! 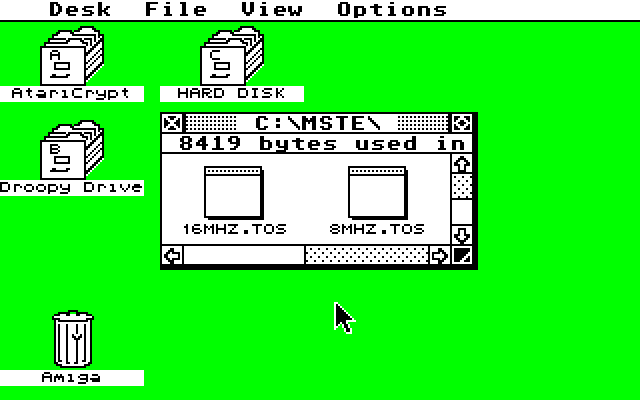 - 8BitChip have a download for hard drives and Old Games Finder have the floppies. - Update: Wasabim has made another great video! 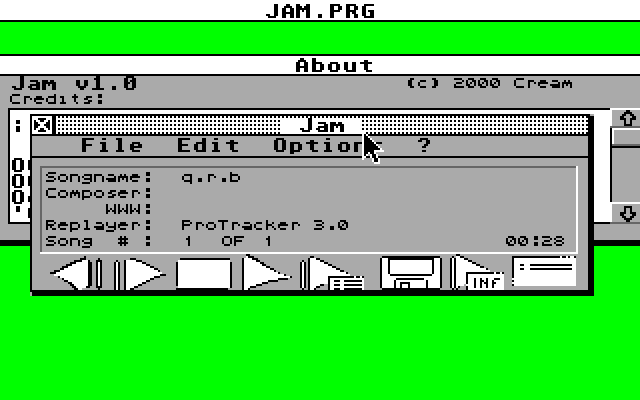 JAM - A true jack of all trades which works either in GEM or with its own frontend GUI. It features plugin architecture for multiple file formats (not just MOD) which is absolutely fascinating. 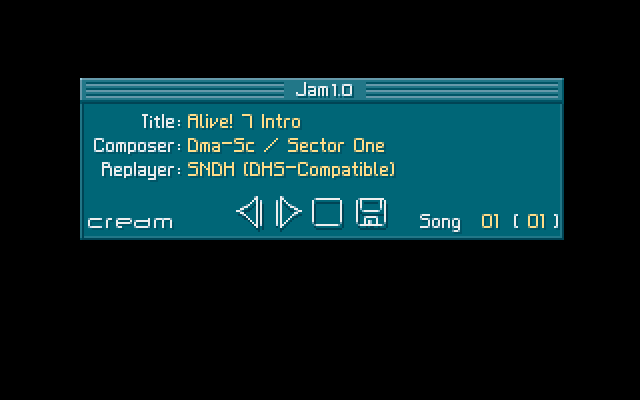 JAM always sounds excellent! Xenon II - STE - Megablast! 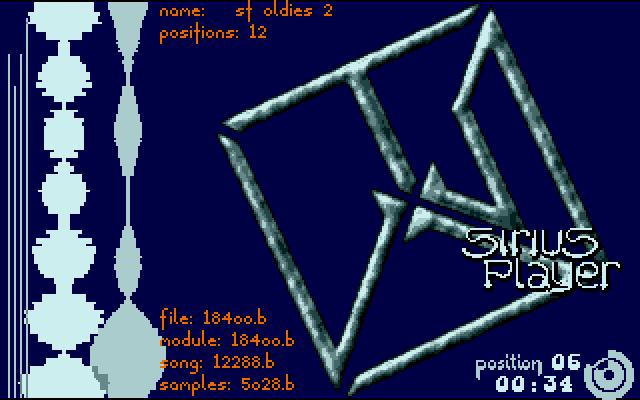 Xenon 2 is pretty much Marmite to most, they either they love it or hate it. Well, I love it because it's one of my favourite shooters with superb power-ups and freaky baddies. 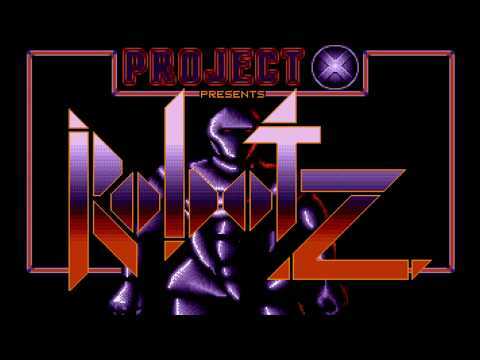 Also, it's technically a coding masterpiece with outstanding graphics and sounds that prove just what the Atari ST is capable of when programmed by developers who have talent and commitment in equal measure. We need no custom chips or lame Amiga ports!! 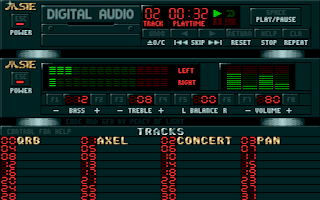 - Xenon II w/ improved music can be downloaded now from 8BitChip. - Use Audacity to convert your tunes into an STe friendly format. 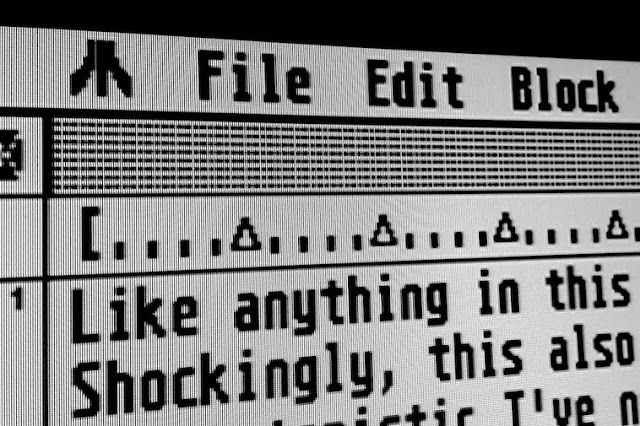 I recently asked Peter Putnik over at 8BitChip if there was a simple program that allowed the Mega STe computer to flip between 8 and 16MHz but without having XControl preloaded. He said yes and a couple days later I was using it!! What a great Atari community we have. The download link is available via the AtariAge forums. Fancy being a thug? 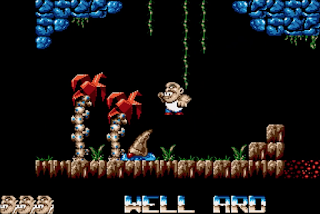 Then today is your lucky day because in Well 'Ard we are a rather fiercely-looking dude that loves to jump up and down on the baddies until they're splattered off the screen. Released in 1994 by Cybernation Software and is an arcade-style platformer written in GFA Basic with fast gameplay and large sprites - I love the snowman. Controls are accurate and responsive with lots of tight jumps on interesting levels. Strangely, we carry no weapons but instead, reap violence using our cute red booties - yep, it's weird but who cares? Jump up and down until they're all dead - not violent at all. Honest. 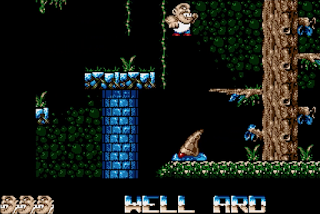 Well 'Ard is a cracking game and to think it was developed in GFA Basic is quite incredible. 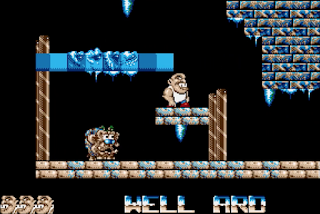 Earlier levels are quite easy but it certainly becomes quite challenging later on - some of those jumps are insanely tricky! This is definitely one of the most enjoyable platformers I've played with addictive gameplay that has you coming back for more. Well 'Ard features some odd critters but don't waste time looking - kill them all. Go on, put on your big red boots and play this belting platformer using either floppy or hard disk. You will love it!! 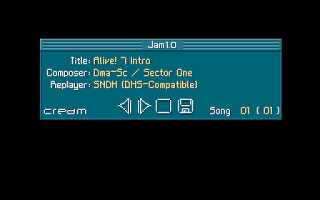 Here is a just a selection of my favourite chiptunes. What are yours?? 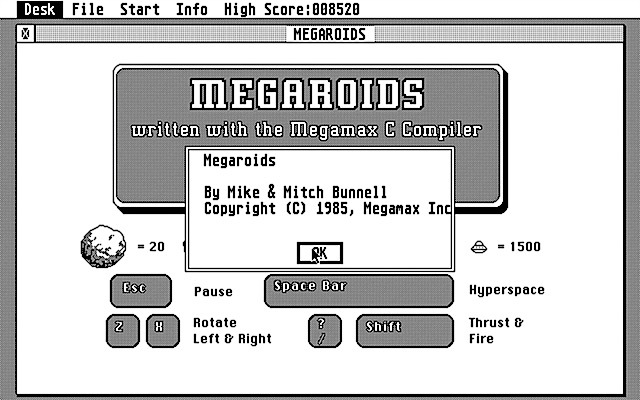 Okay, it's hardly a modern word processor bursting with features but it does the job perfectly well. Sure, I can't wait to get my new colour monitor bought as I'm missing games in glorious 16-bit technicolour. However, I have definitely fallen in love with this crisp black and white display which has met each and every requirement lately. 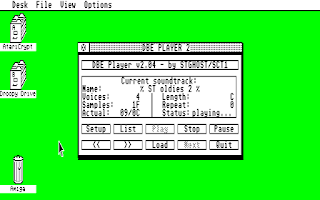 I can just imagine business users in the 80s playing this during their lunch hour! The visuals are different, gone are the vectors in favour of nicely drawn bitmaps sweeping across the screen like butter from a hot knife. This game is smooth and looks wonderful in high resolution. 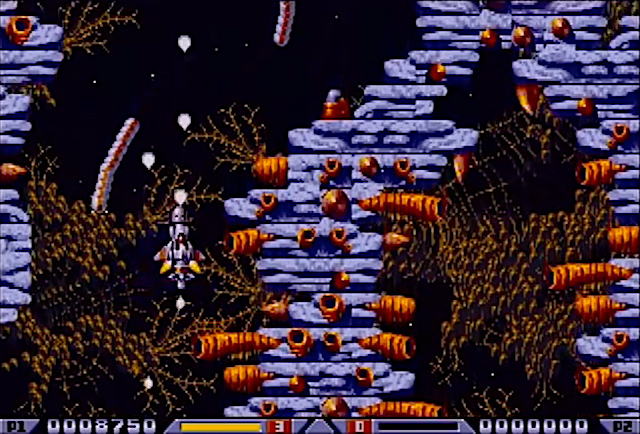 Don't worry, colour systems haven't been forgotten and look just as unique using medium resolution which has been interlaced to 640x400 (4 colours). Wow, this doesn't hurt the eyes and looks gorgeous - I wish more game developers used interlace! Megaroids not only looks gorgeous (well, for Asteroids!) but it plays with an authentic touch I liked. It feels like the real deal and plays extremely well to offer a bucket load of retro action. In fact, a part of me still doesn't grasp how this so good for a 1985 release. Overall, a superb clone that offers tons of fun blasting chunks of rock to smithereens. Both AtariMania and Old Games Finder have access to the downloads. Enjoy and tell me what you think! N.o.B.I Racing was released by Joytrick (1994) and is a 'snake' clone were we guide 'Alfred' through a series of mazes. Always hungry and always on the move, he needs our assistance as he munches everything in his path. However, every time he eats, he grows a little longer and this can become quite embarrassing, especially if he bites into himself. So our task is to help Alfred through the various mazes without him bumping into his own tale. Simple stuff but the gameplay soon becomes fast as you progress through trickier levels and all this during an ever-decreasing time limit. Two types of bonus levels played at frequent intervals, features two-player gaming, DMA audio, and it even supports multiple resolutions. NoBI Racing is very addictive and a bucket load of fun. Great game!